peak in power during the Classic period. Classic period is still a mystery to archeologists. This signals the end of the Classic period. The Maya king and his nobles lived an easy life. They had their every need provided for by the commoners. They were even carried from place to place in litters by slaves. Life as a Maya commoner was full of hard work. The typical peasant worked as a farmer. At the start of the day, the wife would get up early and start a fire for cooking. Then the husband would leave to go work at the fields. After a hard day working at the fields, the farmer would come home and bathe. Bathing was an important part of the day for all the Maya people. The men spent evenings working on crafts such as tools, while the women wove cloth to make clothing. What were their clothes like? The clothing worn by the Maya depended on the region they lived in and their social status. The wealthy wore colorful clothing made from animal skins. They also wore feather headdresses and fancy jewelry. Commoners wore simpler clothing. The men often wore loincloths while the women wore long skirts. Both men and women would use a blanket called a manta to wrap around their shoulders when it was cold. Men and women both wore their hair long. Once they were married, both men and women often got tattoos. The most important food that the Maya ate was maize, which is a vegetable like corn. They made all types of food from maize including tortillas, porridge, and even drinks. Other staple crops included beans, squash, and chilies. For meat the Maya ate fish, deer, ducks, and turkey. The Maya introduced the world to a number of new foods. Probably the most interesting was chocolate from the cacao tree. The Maya considered chocolate to be a gift from the gods and used cacao seeds as money. Other new foods included tomatoes, sweet potatoes, black beans, and papaya. The nobles and kings lived inside the city in large palaces made from stone. The commoners lived in huts outside the city near their farms. The huts were usually made from mud, but were sometimes made from stone. They were single room homes with thatched roofs. In many areas the Maya built their huts on top of platforms made from dirt or stone in order to protect them from floods. Although much of the Maya life was spent doing hard work, they did enjoy entertainment as well. A lot of their entertainment was centered around religious ceremonies. They played music, danced, and played games such as the Maya ball game. The Maya considered crossed eyes, flat foreheads, and big noses to be beautiful features. In some areas they would use makeup to try and make their noses appear large. 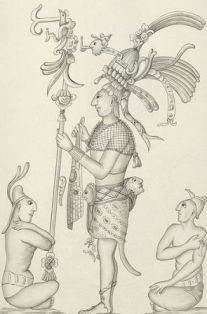 The Maya loved to wear large hats and headdresses. The more important the person, the taller the hat they wore. The farmers of the Maya did not have metal tools or beasts of burden to help them farm. They used simple stone tools and did the work by hand. Sometimes the ball games that the Maya played were part of a religious ceremony. The losers were sacrificed to the gods. The Maya had hundreds of different dances. Many of these dances are still practiced today. Some examples of the dances include the Snake dance, the Monkey dance, and the Dance of the Stag. The lives of the ancient Maya centered around their religion and gods of nature. Religion touched many aspects of their everyday lives. The Maya believed in a large number of nature gods. Some gods were considered more important and powerful than others. 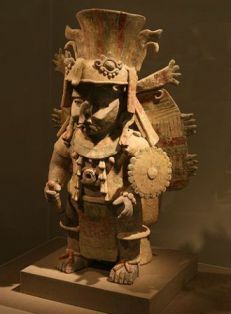 Itzamna - The most important Maya god was Itzamna. Itzamna was the god of fire who created the Earth. He was ruler of heaven as well as day and night. The Maya believed that he gave them the calendar and writing. It is thought that his name means "lizard house". Kukulcan - Kukulkan was a powerful snake god whose name means "feathered serpent". He was the primary god of the Itza people in the latter part of the Maya civilization. He is often drawn to look like a dragon. Bolon Tzacab - Also known by the name Huracan (similar to our word for hurricane), Bolon Tzacab was the god of storms, wind, and fire. Maya mythology said that he caused a great flood to come when the Maya angered the gods. His name means "one leg". Chaac - Chaac was the god of rain and lightning. He had a lighting axe that he used to strike the clouds and produce rain and storms. The kings of the Maya served as intermediaries between the people and the gods. In some ways the kings were thought to be gods themselves. The Maya believed in a scary afterlife where most people had to travel through a dark underworld where mean gods would torment them. The only people who started out the afterlife in heaven were women who died in childbirth and people who had been sacrificed to the gods. A big part of the Maya religion included the stars and the Maya calendar. Some days were considered lucky days, while other days were considered unlucky. They set their religious ceremonies and festivals according to the position of the stars and the days of their calendar. The Maya built large pyramids as monuments to their gods. At the top of the pyramid was a flat area where a temple was built. The priests would get to the top of the pyramids using staircases built into the sides. They would perform rituals and sacrifices at the temple on the top. How do we know about the Maya religion? The main way archeologists know about the Maya religion is through Mayan texts which describe the religious ceremonies and beliefs of the Maya. These books are called codices. The primary surviving books are the Madrid Codex, the Paris Codex, and Dresden Codex as well as a writing called the Popol Vuh. They believed that the world was created in 3114 BC. This was the zero date in their calendar. Some aspects of the Maya religion are still practiced today. Maya mythology tells the story of how man was created from maize. One popular tale told how the gods opened Maize Mountain where the first seeds to plant maize were found. Two popular figures in Maya mythology were the Hero Twins, Hunahpu and Xbalanque. They fought demons as well as the lords of the underworld. The Maya predicted that the world would come to an end on December 21, 2012. Of all the ancient American civilizations, the Maya developed one of the most advanced systems of writing and numbers. They also used a complex system of calendars to track both time and religious ceremonies. The Maya used an advanced form of writing called hieroglyphics. Their writing looks similar to the ancient Egyptians, but is actually quite different. In Mayan hieroglyphics, they used symbols (also called glyphs) to represent words, sounds, or objects. By putting several glyphs together the Maya wrote sentences and told stories. Only the wealthy Maya became priests and learned to read and write. They wrote on long sheets of paper made from bark or leather. These sheets were folded up like an accordion to make books. A Maya book is called a codex (or codices for more than one). The Maya used a number system with the base number of 20 (we use a base-10 number system). They wrote numbers using a system of bars and dots. A bar represented the number 5. Every 5 numbers they added another bar. The number zero was written with a symbol that looked like a shell. 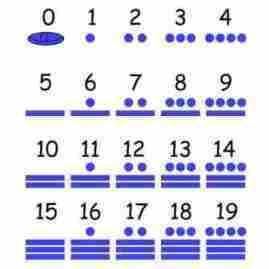 See below for an example of how the Maya wrote the numbers 0 to 19. The Maya had two kinds of calendars, a religious calendar called the Tzolk'in and a solar calendar called the Haab'. Every 52 years the two calendars would start on the same day. They would celebrate the New Fire Festival on this day (El Fuego Nuevo). All the fires throughout their households would be put out and they would throw away all their clay utensils. It was a time of renewal and new beginnings. The Maya also had a third calendar they used for historical purposes. It was called the Long Count Calendar. The Long Count calendar started on August 11, 3114 BC. This was the day on which the Maya believed the world was created. Some people think that the Maya also predicted the end of the world to be on December 21, 2012. Unfortunately, when the Spanish found the Maya codices (books), they thought they were evil and burned them. Only a few survived. The Maya wrote using black ink made from coal and quills made from turkey feathers. Each Maya month had a glyph that represented the month. Some of the glyphs also represented animals. For example, the glyph for the month of Sotz also meant bat, Xul meant dog, Muwan meant owl, and K'ayab meant turtle. The word "Kin" was used to represent a day. It also meant "sun". The base-20 number system is called the vigesimal system. The Maya wrote large numbers in powers of 20. The Maya people built many cities throughout the history of their civilization. The cities acted as city-states where each single large city ruled over the surrounding areas. Maya cities were not planned out in detail like the cities of the Aztecs. They tended to grow out from the center over time. The center complexes, however, do appear to be planned with buildings often built in alignment to the sun. Each city was home to the local king who lived in a palace within the city. It was also home to large pyramids that served as temples to their gods. Typically cities were located near trade routes and good farmland. El Mirador was one of the first large city-states of the Maya civilization. It is thought that, at its peak, over 100,000 people lived in the city. The central center of the city covered ten square miles and had over a thousand buildings. Archeologists have found three large temple pyramids: El Tigre (180 feet tall), Los Monos (157 feet tall), and La Danta (250 feet tall). The La Danta temple is considered one of the largest pyramids in the world by total volume. El Mirador thrived from 6th century BC up to the 1st century AD. It was at its peak around the 3rd century BC. Archeologists think that the city was abandoned around 150 AD and then people moved back in several hundred years later around 700 AD. Kaminaljuyu was a major city-state located in the Southern Mayan Area in the Guatemala highlands. The city was occupied for around 2000 years from 1200 BC to 900 AD. The city was a major trade location for products such as cacao, fruits, pottery, and obsidian. Tikal became one of the most powerful city-states in the history of the Maya civilization during the Classic period of Maya history. The city was large and had thousands of structures including six large pyramids. The tallest pyramid is called Temple IV at over 230 feet high. The city likely had between 60,000 and 70,000 inhabitants during its peak years. Teotihuacan wasn't necessarily a Maya city-state, but was a major city-state located in the Valley of Mexico during the time of the Maya civilization. 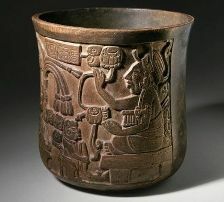 It was so powerful that it influenced Maya culture, trade, and politics during the Classic period. 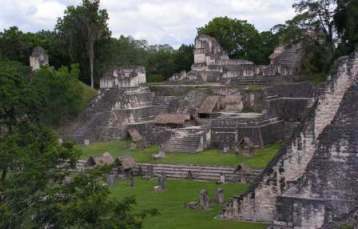 Caracol began as a client state to the powerful city-state of Tikal. It was located in what is now the Cayo District of the country of Belize. At around the year 600 AD, Caracol broke away from Tikal and became a power city-state of its own. The city at its peak was much larger than the capital city of Belize is today. It covered around 200 square kilometers and may have had a population as large as 180,000. 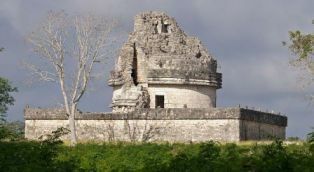 El Castillo - A pyramid and temple built to the Maya god Kukulkan. It is around 98 feet tall. Great Ball Court - The largest of several ball courts in Chichen Itza, the Great Ball Court is 551 feet long by 230 feet wide. The walls on each side of the court are 26 feet tall. Temples of the Jaguar are built into the side of the court. Temple of the Warriors - This temple is a large pyramid with four platforms and an impressive temple on the top. Two sides of the temple are covered with around 200 columns which were covered with a roof system during the time of the Maya. Many of these cities can be visited today. 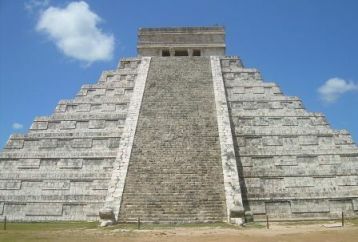 Some of them, such as Chichen Itza and Tikal, are considered UNESCO World Heritage Sites. Around 1.2 million people visit the Chichen Itza site each year. Archeologists have found at least thirteen different ball courts built in the city of Chichen Itza. Other important Maya city-states include Coba, Uxmal, Mayapan, Tulum, Palenque, and Kabah. Palenque was once known as the "Red City" because its buildings were all painted red. Much is known about the kings of Tikal including some of their interesting names such as Jaguar Paw, Curl Head, Shield Skull, and Double Bird. The city was also ruled by women several times. Ahau or Ahaw - The main king or lord of a Maya city-state. Batab - A lesser lord, usually ruling over a small town. Cacao - Seeds that the Maya used to make chocolate. Cenote - A sinkhole or pit filled with water, cenotes were sources of water for the Maya and were also used as places of sacrifice. Chac Mool - A type of statue of a human figure in a reclining position usually holding a tray over the stomach. Chichen Itza - The most powerful city-state during the start of the Post-classic period, Chichen Itza is a very popular tourist attraction today. City-state - An independent government where a large city rules the surrounding area. Classic Period - The golden age of the Maya civilization running from 250 AD to 900 AD. Codex - A type of book written by the Maya that was created by one long sheet of paper that was then folded like an accordion. Glyph - A symbol used in writing. Haab' - The Maya solar calendar that was used to measure time and had 365 days. 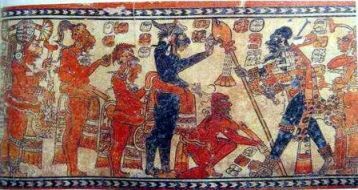 Hero Twins - A major story in Maya mythology, the Hero Twins were said to be the ancestors of the Maya rulers. 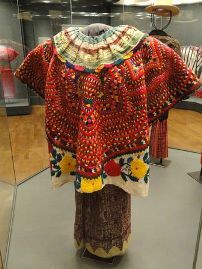 Huipil - A traditional garment worn by Maya women. Itzamna - The main god of the Maya, Itzamna was the god of fire who created the Earth. Kin - Word representing a day in the Maya calendar. Kukulcan - The serpent god of the Maya. One of the primary gods, especially to the Itza peoples of Chichen Itza. Lintel - An architectural element often found over doorways in Maya architecture. Nacom - A high ranking military leader in the Maya army. Obsidian - A hard rock that was used to make sharp edges and tools. Popol Vuh - A book or codex that described Maya religion and mythology. Pre-classic Period - The period of Maya history running from the start of the Maya civilization around 2000 BC to the start of the Classic Period in 250 AD. Post-classic Period - The period of Maya history running from the end of the Classic Period in 900 AD to the end of the Maya civilization in 1500 AD. Pyramid - A large monument with four sides that tapers at the top. 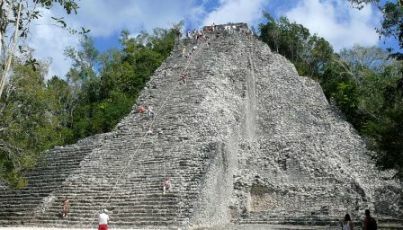 The Maya build step pyramids with flat tops. At the top they built a temple to their gods. Quetzal - A type of jungle bird with feathers that the Maya used in their feathered clothing and headdresses. Stela - A tall monumental sculpture made from stone with relief carvings made by the Maya. Tikal - One of the most powerful city-states during the Classic Period. Tzolk'in - The Maya religious calendar used to track religious days and ceremonies. It had 260 days. Uinal - Word for a month in the Maya calendar. It was 20 days long. Yucatan Peninsula - An area in southeastern Mexico where some of the Maya civilization developed.